Place cream, lemon rind and sage in heavy based saucepan and slowly bring to boil, allow to cool and infuse flavours. Whisk the lemon juice and sweetener with a tablespoon of the hot cream until sweetener is dissolved. Add cream mixture and whisk really well. Cover and chuck in freezer for 1 hour. 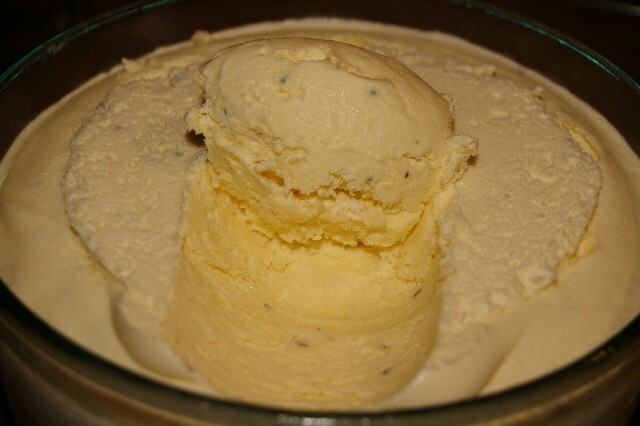 Remove from freezer and give ice cream a really good whisk and return to freezer for 2 hours. Remove from freezer and give it another really good whisk then place in a freezing container with airtight lid (I just used one of those pyrex dishes with silicone lid), seal and put back in freezer until firm. Just finished making this - what a treat! Thanks, Sherrie. It's delicious. Now I just have to try not to eat it all at once! Bumping this for tomorrow as I have 2 large tubs of cream that are due to expire on the 16th and I have my own sage and lemons, perfect! Gives your arm a good work out! Mmm, Sherrie, that looks really good. When hot weather comes around again, I plan to try this.